This is the first photo that I have of myself fishing. The fish was actually frozen stiff, but I didn’t really care, I wanted a picture with my fish. My grandmother had dinner ready so we put it in the freezer for just a minute and well…hours later we remembered him! It’s one of my favorite photos! The year was…ummm… a few years ago and I was about six. I was spending the summer with my grandparents down in Venice. My family moved to Sarasota, Florida and my grandparents lived close, so I would go stay with them during the summer while not in school. I spent most every summer down there until I was about 11 years old. Sometimes my three older sisters would be there or maybe it was just my cousin Christopher and I. Those summers we spent down there were some of the best summers of my life… but I forgot how great they were and how happy I really was. Back in the 70’s…giving my age away… both of my parents were working a lot. I had older sisters who would watch me most of the time, but to go to my Grandparent’s house, that was the best!! They lived in a mobile home park, which to this day is still one of the nicest I’ve ever seen. They had two clubhouses with huge pools and many lakes. I would be lying if I said it was the most boring place for a six year old. Oh and I got to drive golf carts around everywhere, it was awesome! They had pairs of swans that patrolled the lakes they were super scary and they chased me home a lot, but it was still fun. My grandfather, I believe, was one of the most patient men that had ever walked the face of this Earth. He had 4 granddaughters and 3 grandsons and we all wanted to fish. He taught his daughters and all of his grandchildren, because he knew we would love it as much as he did. He spent most of his time putting bobbers and hooks back on our poles after breaking our lines that were always horribly stuck in the rocks at the Venice Jetties. I don’t believe that I actually ever remember him fishing at all. He was always helping us and there were so many of us! He would go from one to the other and never stop the entire time we fished. We were very high maintenance, it’s a miracle he lived to 99…we must have really kept him in shape! Most of the time I would fish in the lakes at the park. They had a beautiful clubhouse with a porch overlooking the lake with big wooden rocking chairs. I would gather a bag of old bread and a couple of hot dogs, and head over to the clubhouse porch to fish every day! They had thousands of blue gill that could easily be caught by balling up a piece of bread or ripping off a piece of hot dog. You would carefully put it on the hook and lower it into the water. Hopefully it stayed on long enough for a fish to get it and if you mastered the art of bread balls…you could pull up fish every minute, all day! They would feed like piranhas! Not much sport in it, but could be very competitive when seeing who could catch the most or the biggest. Now the biggest fish in the lake were the bass, but the biggest was this one large mouth bass, “Big Daddy Bass.” He was a mythical creature that others spoke of, but few actually ever saw. In my years of fishing there, I saw him maybe five times and I caught him once! He was too heavy and broke the line, but it was an awesome day!! 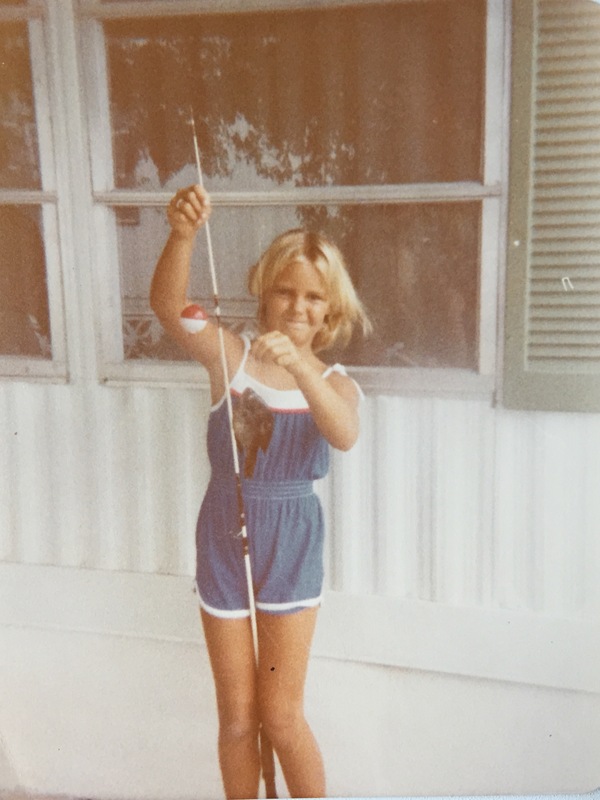 I loved fishing and it was hard to keep me away from the water back then. I don’t know really know what happened to me, but I guess I just discovered horses and boys, which left no time to fish. As I look back, there was never a time where I loved living in Florida, I’ve always wanted to move to the mountains and be near lakes. I’ve truly hated living in Florida and as I grew older, I never went to the beach and definitely would not go in the water or fish. If it was a holiday that my big, crazy, awesome family would spent out at the beach I would go. I might fish, but it was just to pass the time, no real enjoyment. Then in March of this year I was contacted about a Heroes on the Water event at Robinson Preserve in Bradenton. They offered to take my family and I out in kayaks to fish for no cost, since I was an Army Veteran. Not many fish were caught, but I caught the fishing bug that day…my love of fishing returned and what happened next would change everything! Shortly after that, I had decided to have a tumor in my neck/head surgically removed. I had ignored it for a few years, for the fear of having partial facial paralysis. I was having problems that left me no choice but to remove it. We tried to biopsy the tumor, but it was in such a tight area, they couldn’t get a good sample. So going in to this surgery, we had no idea if it was cancerous or not. I was under a great amount of stress from my job and my doctor said there would have to be changes made in my career and a lifestyle change with more fun and less stress! I spent every moment like it was my last, I fished a lot with my younger son and then I went in for the surgery. Praise Jesus that it was not cancerous! I realized there were many changes I would have to make in my life. When I was recovering, I realized how much I had truly missed fishing all of these years. I realized how much I LOVE where I have lived for almost 40 years. I realized that I have not been living, just going through the motions and I was ready to start the life I owed myself, my husband and my children. I was ready for joy, laughter, contentment and peace with who I am. For anyone praying for God to change a family member or friend’s heart…I’m proof! He completely changed my heart…it took 40 years, but it can be done, please don’t lose hope! I know this was a long story, but I felt the need to bring you up to speed, to how I got here and why I’ve turned a photography blog into a fishing & lifestyle blog. I’ve been fishing non-stop since I recovered from my surgery back in May. I’ve searched for 2 months for the elusive redfish and finally caught one! I will have to tell that story another time, but know that it’s my favorite fish, so strong and gentle all at the same time! Don’t get me started on how beautiful they are! I try to fish 3-5 times a week and it still seems like I want to do more. When my son is tired and wants to quit…I’m just getting started. I would love to fish professionally one day, hopefully before I’m 60 or I won’t be able to get the fish in the kayak! I fish by kayak when weather permits, but it’s summer and highly unpredictable like a toddler. So lately, it’s been pier fishing, which is not my favorite, but please know how grateful I am to just be fishing, to be alive and to spend time with my husband and kids! Someday I’d like to have a small boat, maybe I’ll win one…maybe I won’t…but it won’t matter either way…because I’ll still be fishing! If you ever want to fish, I’d love to go! If you don’t know how to fish, I’ll teach you everything I know, which honestly isn’t a lot, but I’ll make sure we have some fun. If you know a lot about fishing, I’d love to learn anything you are willing to share. Next Post If you focus too hard on the prize, you might miss the beauty of the journey!